The Las Vegas Review-Journal’s high school football rankings for Class 4A, 3A, 2A and 1A. 1. Bishop Gorman (5-2, Last week 1) — The Gaels haven’t allowed a point to in Southwest League play. 2. Liberty (5-1, LW 2) — Hard to a see a scenario where the Patriots don’t win the Southeast League. 3. Arbor View (6-0, LW 3) — The Aggies are the only team in Clark County without a loss. 4. Green Valley (5-1, LW 4) — The Gators host the Henderson Bowl against Basic on Friday. 5. Foothill (5-1, LW 5) — It took Liberty to finally hand the Falcons a loss. 1. Desert Pines (3-2, LW 1) — Last week’s win against Mojave has the Jaguars in cruise control toward a Sunset League title. 2. Mojave (4-2, LW 3) — A tough loss to Desert Pines aside, the Rattlers lead the Sunset League in wins. 3. Moapa Valley (5-1, LW 4) — The Sunrise League may be decided in Friday’s rivalry game against Virgin Valley. 4. Chaparral (5-2, LW 2) — The Cowboys will need some help if they are going to win the Sunrise League. 5. Virgin Valley (4-2, LW 5) — The Bulldogs can throw the Sunrise League standings into chaos if they beat Moapa Valley. Needles (6-0, LW 1) — The Mustangs can basically wrap up the Southern Region title with a win against Lincoln County. Lincoln County (5-2, LW 2) — Friday’s game at Needles might be the Southern Region title game. Democracy Prep (3-2, LW 3) — The Blue Knights have outscored Southern Region opponents, 150-12. Lake Mead (3-2, LW 4) — With games against Needles and Lincoln County in the rearview mirror, the Eagles have a great shot of returning to the postseason. The Meadows (2-4, LW 5) — The Mustangs look to keep their playoff hopes alive against a Calvary Chapel team that has scored 18 points this year. 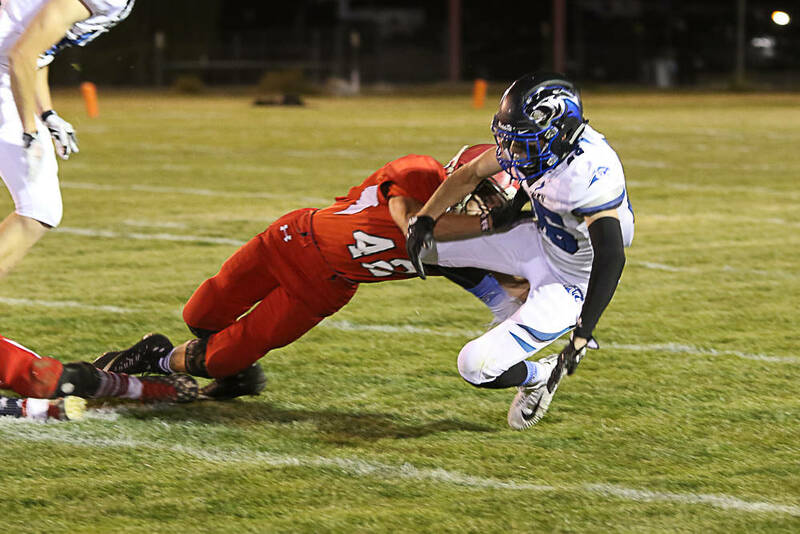 Pahranagat Valley (6-0, LW 1) — The Panthers have had Friday’s game against Spring Mountain circled for months, and it could be a Southern Region title game. Spring Mountain (4-1, LW 2) — The Golden Eagles snapped Pahranagat Valley’s 104-game winning streak last year, and a win Friday could give them the region title. Beatty (4-0, LW 3) — With all the talk about Pahranagat Valley and Spring Mountain, don’t forget about the Hornets, who have scored 147 points in their last three games. Tonopah (3-4, LW 4) — The Muckers win against Indian Springs sets them up nicely for a return to the playoffs. Indian Springs (1-5, LW 5) — Despite their ugly record, the Thunderbirds aren’t out of the playoff conversation quite yet.